Rob Sheppard is one of the best photo bloggers around. He brings a reflective and philosophical dimension to his writing that I don’t think I’ve encountered so consistently since the passing of the late, great Galen Rowell. In his most recent post, Rob describes how he arrived at his intended photo destination too late for the “good light” — and made the most of it, experiencing things he would have missed had he arrived earlier and then not stayed on. Nature is not bound by arbitrary rules, he says, and he was amply rewarded by being open to (and taking advantage of) what was available instead of being disappointed by something not conforming to rigidly preset expectations. 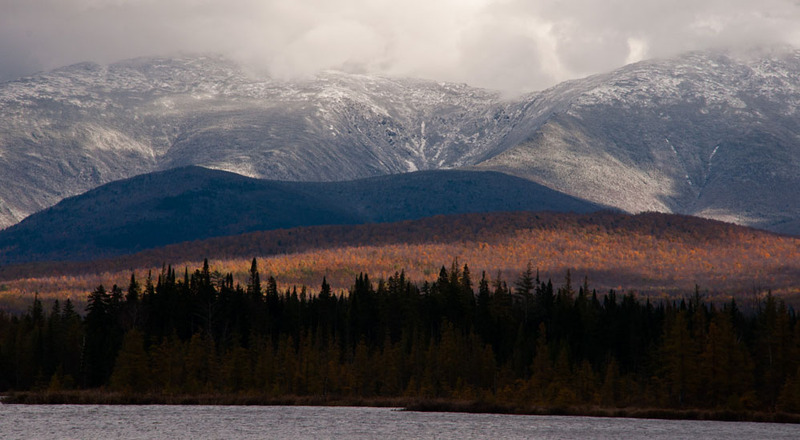 It was timely that I read Rob’s post when I did, because I had just returned from a few days’ foliage shooting in the White Mountains of New Hampshire and had a similar experience — the difference being that I knew in advance that I was heading right into the unexpected and had to be open to anything. 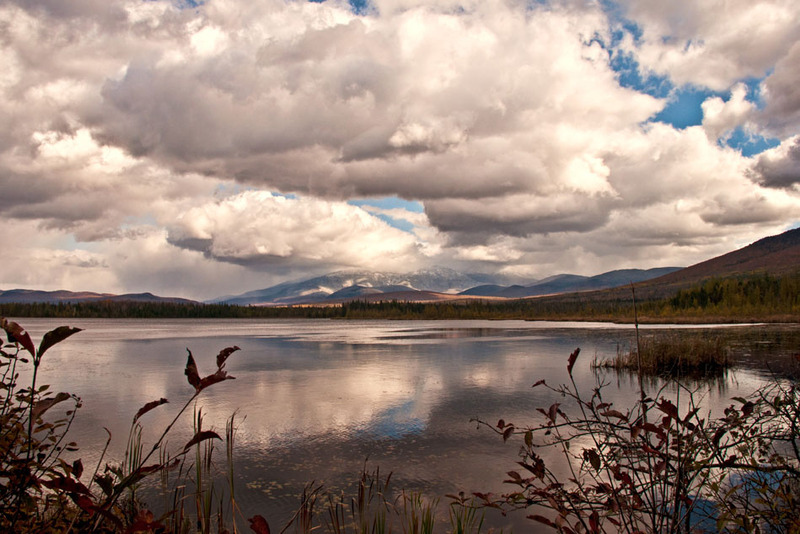 At this time of year, with the seasons changing, the New Hampshire mountains create their own weather, and anything is possible, including experiencing bright sunshine, clouds, rain, snow, and wind all in one day, in fact all in one afternoon. Things can change drastically when you travel a couple of miles. So, all I knew when I headed northwest for the Pondicherry Wildlife Refuge was that it wasn’t likely to be pouring rain, which was fine, all I needed to know, it was the last thing I wanted. Getting to the Pondicherry trailhead is one thing (I’ve met many native New Hampshirites who’ve never heard of the place); then you have to hike in a good mile or more to where the action is: the shore of Cherry Pond with the spectacular view of Mount Washington and the Presidential Range on the other side. It was quite a windy day, which meant (1) the light and other atmospheric conditions might be changing several times in the course of a minute; (2) there might not be any reflections of the mountains on the pond. It did turn out that the wind occasionally abated enough to create some reflections on the pond, but I discovered that the action of the wind, when it blew, on the water produced its own kind of beauty — a shiny texture. As for the rapidly changing light and other conditions, there was nothing to do but set up the camera, find a good composition that could be tweaked here and there, watch and enjoy nature’s amazing show, and press the shutter button whenever nature’s kaleidoscope produced a new version of the scene in front of me. It was indeed quite spectaular. 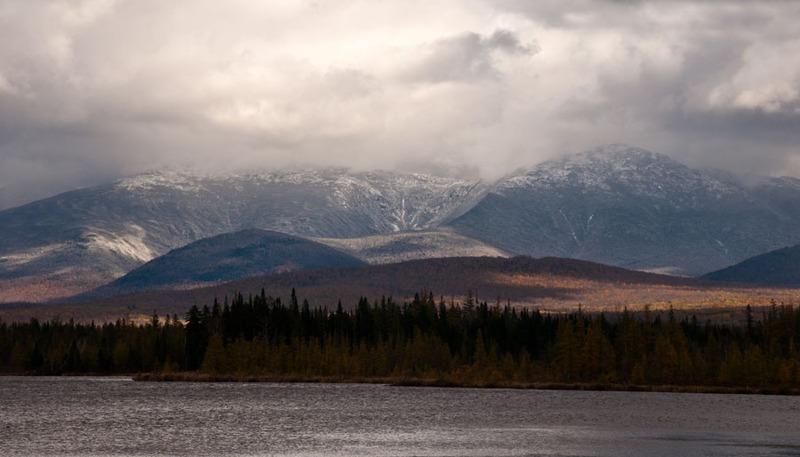 We’ve heard of son et lumiere — “sound and light” shows, but this was neige et lumiere — snow and light, as the interplay of snow showers and sunlight continuously created different scenes on Mount Washington’s peaks. When I arrived in New Hampshire a few days earlier there was no snow on the mountains. The morning after my visit to the Cherry Pond, Mount Washington could be seen from North Conway completely covered in snow gleaming in the bright sun. Amazing. Sun, snow, and mountains, bless the Lord. Here’s a selection of images from this shoot. I’m not going to dwell on the technical details — that’s not really important except to say that I tend to do much less processing in straightforward nature shots than in other types of images because I want to let the natural beauty show through, and thus my processing is aimed at helping that along rather than at enhancing the image in a way that suggests that the Creator didn’t get the world quite right. These and my many other photos (always adding new ones) can be viewed (and purchased) on my Zenfolio site. What a great set of images. I need to get up to the northeast and see these mountains for myself. I especially enjoy the complimentary colors of the blue mountains and the golden hues of the forest. Thanks, Nick! It’s a special time of year when one season is trying to “horn in” and replace the present season. I love it.